The SP serial management port is labeled SER MGT. Use the SP SER MGT port only for server management. 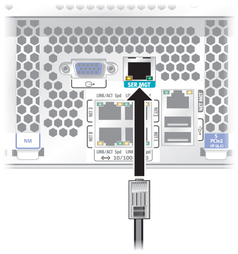 This port is the default connection between the SP and a terminal or a computer. Use this port for server management. Caution - Do not attach a modem to this port. Connect a Category 5 (or better) cable from the SER MGT to a terminal device. When connecting a DB-9 cable, use an adapter to perform the crossovers given for each connector.